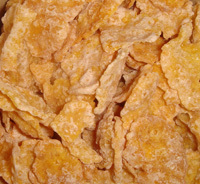 I will say this about the no name Frosted Flakes (which sound very similar to a brand called Global Brands which has a rather large distribution among the dollar stores in South Florida): They make a decent dry snack because they are less likely to crumble into sugared corn dust. But read your labels: these no-name brands almost always have no fortification, so their nutritional value is very low. Marvo is right. The non-branded is using the classic Frosted Flakes font. I have always loved the fine print on the Kellogg’s box: “Of Corn.” Did Kellogg’s once have other flake cereal? Rice? Barley? SKIN?? Marvo is always right. And don’t you forget it! Dave, I suppose it’s because you might have wanted frosted flakes of wheat instead. I can imagine something like frosted Wheaties. I remember a maple-flavored frosted cereal like that called Buc*Wheats. 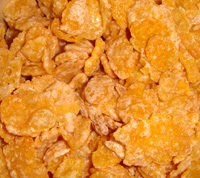 I think a multi-flake cereal would be cool: corn, wheat, oat, rice, and barley flakes. I’d certainly buy a package if one came out from Kellogg’s, Quaker, General Mills, or Post. 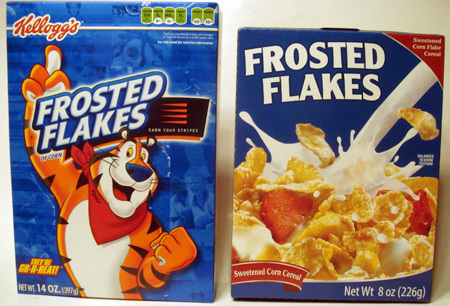 I looked on Kellogg’s site and according to their timeline Tony the Tiger has always been the mascot (since 1952!) and was even on the first box. That dollar store Frosted Flakes box is a total rip-off in the guise of retro! Those no-names are actually by Greenbriar international, in Chesapeake,Virginia. I found them at the dollar shop.